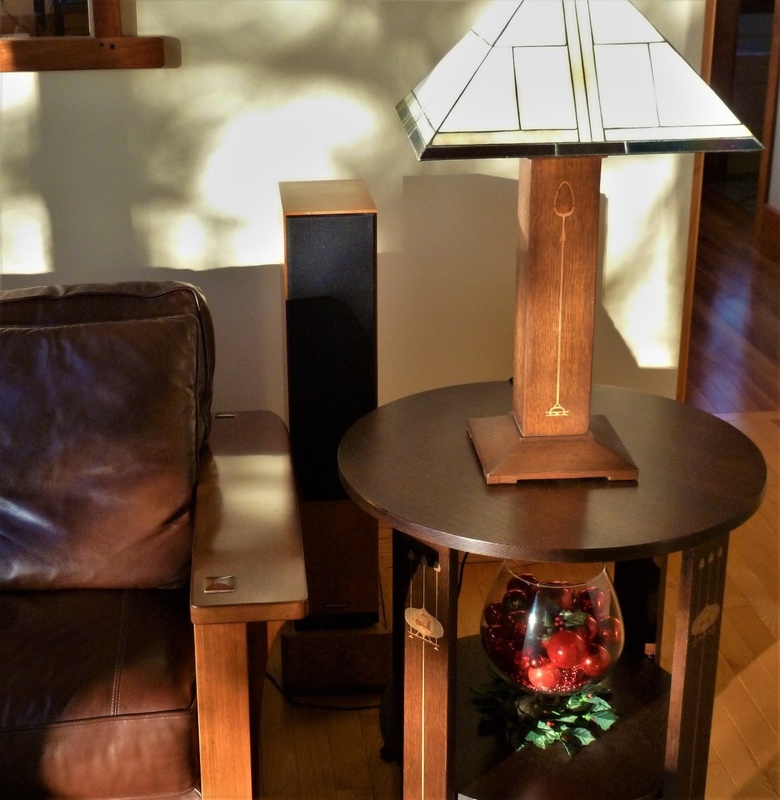 Another installment in the C/H/E series, a My Audio Life special and my wife gets her first stereo system in over forty years. ‘What ifs?’ are one of the things most people like to mentally tease themselves with, on occasion. When we stop and think about all the coincidences and random events that shape our lives, the mind boggles. My ‘What if?’ is, ‘What if I had never been interested in audio?’ I can say with great certainty my life would be nothing like it is today. The long and the short of it is, I met my wife of over four decades because of my interest in audio. It’s a bit of a convoluted story, but humour me. Back in the mid 1970’s, I was a young man with no attachments. Life was simple, I thought about the cars I’d buy if I was rich, I bought records, I listened to them on my stereo. Audio, a hobby I’d had since my early teens, was fun and non-demanding. Who needed anything more than an Empire cartridge on a Sony direct-drive turntable? A 40-watt Pioneer solid state amp was great. Speakers? A pair of $15, 10” woofers and $3 tweeters in plywood boxes were fine, were they not? I wasn’t with anyone special at this time. One of my brothers dated a young woman briefly, a sweet girl, probably deserved an Academy Award for the interest she convincingly displayed when I showed her my stereo. Several months after she and my brother had parted ways, she called. Her older sister had a new stereo and only one channel was working. Would I come and have a look at it for her? Who wouldn’t? Especially when the sister lived in a nursing students’ residence! Do you find digital components kind of, well, boring? I do. Don’t get me wrong, I enjoy good digital playback as much as the next person. As long as the next person isn’t Michael Fremer. Don’t get me wrong (again), I read Michael’s columns and enjoy his descriptions and pictures of esoteric analogue gear. Digital gear just seems to be ‘black boxes’, even if they are silver-looking, like the photo of the Lumin D1 above. Speakers and tube amps are, to me at least, far more interesting. There’s so much more variety. 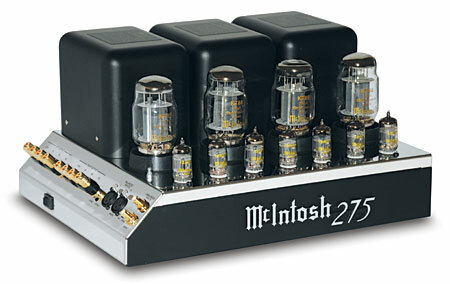 I mean, look at the picture of the EarMax headphone amp in MAL Part 9, or the McIntosh pictured below. They are, to tube-loving audiophiles, the equivalent of a wet T-shirt contest. When first offered the Lumin for review, I kind of shrugged it off. I’d just finished wrestling with the NAD 50.2 )see Digital Music Player Reviews Part 1). Quite frankly, my analogue brain hurt from all the digital goings-on. Besides, I’d just scored the Spendor D7’s to review, and they seemed far more interesting. Once the Spendors had cleansed my digital palate, so to speak, and upon reluctantly returning them, I was in a calmer frame of mind. Tackle the setup of another digital player, how hard can it be? In all honesty, not that hard. By that time, with the help of NAD’s superior customer service, I’d been able to backup the music stored on the 50.2, onto standard Western Digital and Seagate USB-connected drives. Upon insertion into the jack on the back of the Lumin D1, they fired right up. When I say fired right up, I mean the drive started to spin. The Lumin app doesn’t allow access to the music on the drive – or even acknowledge its presence – until all of the meta data containing the album art and text has been read, for every file. I read somewhere that the Lumin players might not cozy up to any old backup drive connected to them without these drives being configured correctly. With nothing to lose, I just plugged in one of my cheapo drives and after waiting as described above, a folder appeared on the Lumin app and there were all of my files. One of the frustrations an old codger like myself finds extremely irksome is that one isn’t told (nor does a message pop up on the Lumin app), telling one to wait. It’s not the time it takes to load that irks, it’s that a pop-up message or even a little spinner isn’t displayed, to tell you something is happening. Once I’d figured that out and the drive was read, music poured forth. I should mention that the D1 requires an Ethernet network connection. It doesn’t do Wi-Fi. Though the Lumin D1 has been replaced by the D2, I suspect the same setup information applies to it as well, and quite likely the other Lumin, devices as they all appear to use the same app. When my now wife was in nurse’s training, men were verboten in the residence. Showing up with a tool box worked, however, and the doors swung wide to welcome me. If I’d only known that years before. It was, to some degree at least, like an adolescent movie fantasy. According to my now wife, nubile young women were running around a great deal of the time in their underwear, though I saw little evidence of that. The semi-functioning “stereo” was a ghastly device that made even my questionable system seem high-end. A receiver with a record changer mounted on top was the heart of the system. The speakers, each containing about a 5” driver, were housed in small cabinets made of pressed board. The receiver worked on both channels, but records only played on one. I offered to take it away and fix it. The cartridge was a nasty ceramic contraption. I interchanged the left and right channel leads, and music, of a sort, played in the formerly dead channel. The cartridge was defective. When I took the cartridge apart one of the leads from the ceramic crystal was not connected to the output pin. After a bit of minor surgery both channels worked equally well. The nursing students could now listen to their Barry White albums in dynamic stereo sound. The repaired stereo was returned to the owner, but this time I didn’t get past the front desk at the residence. In fact, I don’t think I even saw the owner. I just left it with the desk commandant. Over the next few weeks, I tried to connect with the owner of the stereo, she of the waist length, wavy, chestnut-coloured hair, but to no avail. No connection could be made. I wrote it off as one of those things that just wasn’t meant to be. The Lumin temporarily displaced the NAD 50.2 in my system. By this time, I’d hard-wired the NAD with its own Ethernet cable, so it was an easy swap. My Cambridge CD player/DAC was given a rest, as the Lumin has a DAC built in. The Lumin’s balanced analogue outputs were used to good effect with my ARC line stage and power amp. I can’t say I did any intense critical listening. I was giving the Spendor S3/5R2 speakers a semi-critical listen at the time, so the rest of the system was in a state of flux as well. On reflection, I think the Lumin might have been the equal of the NAD/Cambridge combination. The NAD had spoiled me, as it already had the TuneIn internet radio app loaded. 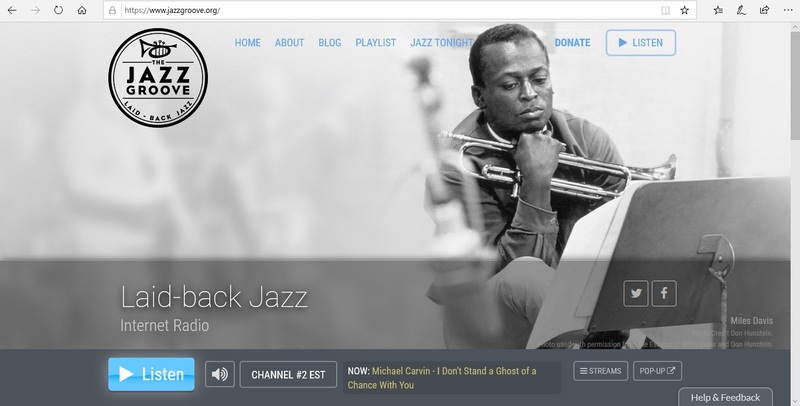 My wife and I had gotten in the habit of spending an hour or so in the evening listening to music, sometimes to The Jazz Groove, using the TuneIn app. A few of these evenings included listening with the small Spendors mentioned above. Almost simultaneously, my wife and I realized that we were missing music in the main part of our house. We both had spent virtually all of our working lives in noisy environments, she in a hospital emergency department, and I in a busy engineering office, which more often than not sounded like a bus station. It had taken several years of quiet in our retirement, to want sound – specifically music, back in our everyday life. Our main system resides in the home entertainment room in our basement. It didn’t take much convincing to get a conditional buy-in on a system for the main floor of our house. The configuration of this system was, however, still open to negotiation. The main floor of our home is open-plan, so music can be heard through most of the main and second floors. Also, if there was to be a system, access to internet radio would be a must-have. With the small Spendor S3/5R2’s due to be returned any day, I briefly set them up on two end tables, see below, dusted off an ancient Hafler solid-state amp (more on the Hafler later), and connected my FiiO M3K player to its inputs. (see link to holiday gift guide above.) This gave me a demonstration system with which to sell my idea. I’d already copied a significant portion of our digital music library over to a couple of micro SD cards. I could play whatever the lady of the house desired on the demo system. A little Ella Fitzgerald and some Miles Davis, and it was a done deal, almost. Take my niece, please. You wouldn’t think it to look at her, but she eats like a horse. Speakers on the end tables didn’t appeal to the lady of the house. I cautiously suggested floor-standers no wider or higher than the small Spendors on loan and bless her, she agreed. My ever-patient wife specified that they should be located behind the end tables. Yes, I know, not the ideal location, but she allows me to do whatever I wish in our H.E. room. 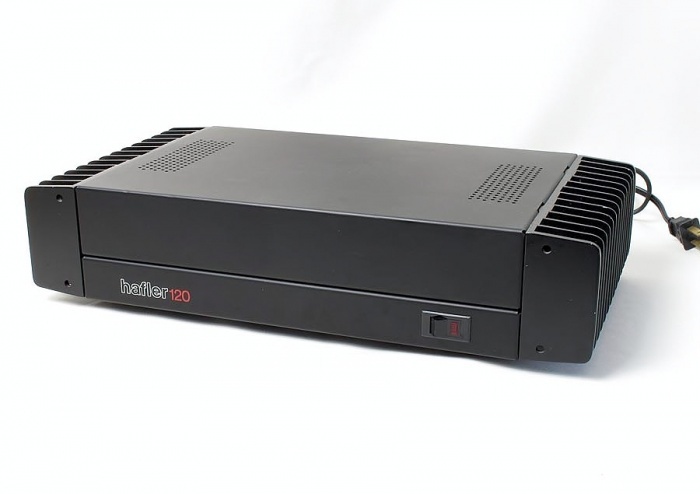 A troll through the floor-standing speaker ads on Canuck Audio Mart netted a pair of year-old Spendor A5R’s at not much more than half of their original list price. No aversion was expressed regarding the purchase of the Lumin D1 either, especially at a clearance price. (See link to the holiday gift guide above.) All that remained was to figure out how to get the TuneIn app functioning on the D1. One quiet afternoon, when I had the house to myself, I connected it to my workshop system. The internet router/modem resides in my workshop, making an Ethernet connection handy. As far as I’ve been able to deduce, it’s difficult to set up the internet radio app directly from the tablet used to control a D1. It probably is easy but I’m terrible with touch screen devices. Give me a proper keyboard and mouse any day. To help out a fellow Lumin owner who lives a couple hours drive from me, I documented the TuneIn setup as I performed it on my laptop, then sent it to him as a PDF. The link below will take you to that somewhat crude instruction if you wish. The other thing about the Lumin, it’s mentioned on their site, is that their digital devices will not necessarily play all of the various encoding schemes used by internet stations. If you must have, say, Radio Ngati Porou 88.2 from Ruatoria, New Zealand, get the Lumin dealer to put this into the favourites on their demo unit just to be sure it will decode before you heap yet more abuse on your credit card. About three months after the stereo repair I was coaxed into going to a farewell party being held for the friend of someone I slightly knew in high school. To my surprise the owner of the stereo I’d repaired months earlier was also attending the party. We started talking and after a while decided to depart the noisy party. That was, in effect, my first date with the woman that is now my wife of more than forty-two years. I promised not to relate the incident of someone, who shall not be identified, that mixed wine and beer, the result of which was volcanic vomiting. I lied. After three months of dating we were engaged. Less than a year after that we were married. The location of the D1 in our living room is almost directly above the internet modem that resides in my workshop. It was not that difficult to fish an Ethernet cable up to the living room and terminate it in a wall jack. But my trickery didn’t stop there. The D1 has both single-ended outputs on RCA jacks, and balanced outputs on XLR’s. The RCA outputs are connected to the Hafler in our living room with some entry-level Cardas interconnects. Some home-brew, no-name cables from the XLR’s run down to the workshop amp. The Hafler connects to the Spendors with lengths of inexpensive Furutech speaker cable I terminated myself with some AudioQuest spade lugs. The old Dynaco in my workshop connects to some mini Wharfedales with lamp cord. How does it sound? Wonderful. We usually switch the system on about mid-afternoon and listen while dinner is being prepared and eaten. It has become our habit to listen through to early evening, or occasionally all evening, sitting in the living room after dinner. The speaker position isn’t ideal but we don’t listen to the stereo, we listen to music. When The Jazz Groove gets a bit too sedate (it’s mostly instrumental music), my wife will suggest some vocal music. A few deft finger flicks of the iPad, and we might listen to some Ella Fitzgerald stored on our music drive. Speaking of Ella, is there any other voice quite as magical as hers? “Music lives in the midrange.” I forget which audio writer said that. I wish I had. I had on loan last summer, speakers with a hole in the midrange. They were so un-engaging to listen to that I couldn’t wait to have them gone from my listening room. The Lumin-Hafler-Spendor system, though not the ultimate in extension, dynamics and detail, gets the midrange right. The sound of Ella’s voice as heard on my wife’s system is simply delightful. I also hear things in familiar recordings I hadn’t noticed before. A cliché I know, but a treat when it catches you unawares. If the mood calls for a little warm-weather music, our living room system is more that up for some Bob Marley. It has pace and rhythm aplenty that makes it difficult not to dance, and impossible not to tap your foot. Pace, rhythm and dynamics are something I value greatly in a music system. It’s not that I’ve set out to be especially attuned to it, but if it’s missing, I certainly notice. I have come to the conclusion that it’s not just one component that “gives” a system this feature. All components in the reproduction chain must have it. If one link falls short in this regard, it can drag the entire system down. I’m sorry if I can’t be more specific on the sound of the Lumin. I find good digital, and the NAD 50.2 fits into this category in my estimation, difficult to comment on. Bad digital is easy to pick apart. The best I can suggest for either player is audition them for yourself. Take some files on a thumb drive to a dealer, and ask to play them. There might be something with one you might find annoying that doesn’t bother me. My brother, mentioned earlier, played the trumpet in the high school band. It isn’t easy living in the same house with an amateur brass player. That’s likely why it has taken me forty years to appreciate Miles Davis. My wife, as I was to learn, also played the trumpet in her high school band. My mother-in-law wouldn’t allow trumpet practice in the house. She made my wife and her sisters, who played the trumpet and trombone, practice in the sunroom located between the house and garage. As it turns out, my wife was exposed to Jazz for the five years she studied music in high school. I only discovered recently that she likes Jazz. I think the Barry White and Moody Blues albums she had as a student caused me to discount her musical tastes. Lumin’s app for their players seems fairly glitch-free. The buttons are smaller and closer together than the ones on the BluSound app that runs my NAD 50.2. They’re a bit too small for my stubby fingers, though my wife doesn’t have a problem. The Lumin app, other than the album art, is a rather drab light grey, or an optional dark grey. It could do with a bit of a makeover. The display on the Lumin device itself shows track time and bit rate. It’s not a touch screen like the display on the NAD, so it doesn’t actually do much except for one smart feature. When connecting the Lumin to a network it will display “Network Error” if it’s not connected properly or if the connection fails. Couldn’t Lumin have put up a message saying “Files Loading Please Wait” or some such when a drive containing music files is first connected? I’m not keen on the playlist-oriented format, but I can live with it. The Double-Tap option is very convenient and helps avoid inadvertent selection. Double-Tap also makes it easier to add whole albums to a playlist. The Lumin app is loaded on my wife’s iPad, that resides in our living room. Very little coaching was required for her to master it. With the flick of a power switch on the Hafler, a few finger strokes on the tablet and my wife’s second ever stereo system gives her, well, both of us, great pleasure. Year-end Bonus: Part Two of the CHE (Classic/Heritage/Exotic) Series. 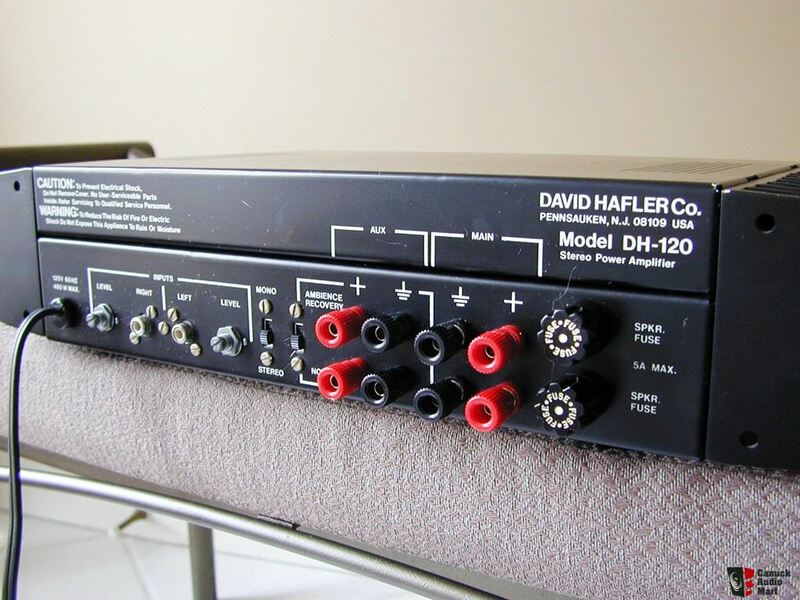 DH-120 amps were built between 1984 and 1989. Just because they’re old, doesn’t necessarily mean they’re good. I’d bought mine to power a subwoofer, but it had been languishing in the back of a closet for 20 years or so. I put shorting plugs in the inputs and 12 ohm, 20 watt power resistors across the speaker outputs. When powered up, one of the channels had a bit too much DC offset, but after a few hours it dropped back to an acceptable level. The heatsink on one channel ran much cooler than the other. A quick web search and a measurement with a multimeter indicated that the cool channel was running at lower than specified idle current. A turn of the bias control brought it to spec. Connected up in my main system, the old Hafler sounded decent. The DH-120 has MOSFET output devices. I think it exhibits a bit of what erstwhile Stereophile contributor Sam Tellig once called the ‘MOSFET mist’, a bit of an airy upper midrange/lower treble cloud. Not unappealing, but a bit of a minor colouration that is most apparent when switching over from tube amps or solid-state amps with bipolar output devices. MOSFET’s are sometimes criticized for their less sure grip at bass frequencies compared to conventional bipolar output transistors. Connected to a variety of speakers, I noticed nothing overtly lacking in the bass. Some of the Haflers, mine included, were known to have power transformers that could expire prematurely. Mine happened early in its life and was replaced under warranty. The aluminum heatsinks were painted rather than anodized. As a result, most are missing some paint and look scruffier physically than they are electrically. If a DH-120, or any solid-state Hafler crosses your path at a yard sale or on Kijiji for a knock-down price and it powers up, grab it. I gave my DH-120, it’s rated at 60 watts per channel into 8 ohms, a bit of TLC. The heatsink compound was replaced. This normally gooey stuff, employed to transfer heat from the output devices to the heatsinks, can dry up over time and be less heat-conductive. The crappy volume pots, so-so input jacks and cheapo output connectors were replaced with decent though not exotic modern parts. Fast recovery diodes replaced the mediocre bridge rectifier originally supplied. The DH 120 had secondary pairs of speaker outputs, a bridging circuit to turn it into a mono amp, and a switch for a passive ambience recovery system. These, seen above before removal, were all ditched. At some point, replacement of the power supply filter caps should happen – but that can wait until I next order a bunch of parts from either Digikey or Mouser. There are upgrade boards and parts available from several suppliers if you want to spend freely, but the stock unit is fine in my estimation. So yes, I consider the DH 120 a classic and a worthwhile component in a contemporary system too. Not quite up to ultimate contemporary standards in stock form, but eminently musical nonetheless. No rant this time. As this article was being written, my wife has officially retired from nursing. She stopped working three years ago but hadn’t given up her registration until now. As of December 2018, she can no longer call herself a registered nurse. Nursing was a large part of her identity, and cutting that final tie was tough. It was the job, or rather the calling, she was born to do. She worked for over 25 years in the emergency department of our local hospital. Most nurses typically burn out after 2 or 3 years in emerg. During her time as a nurse she had been nominated for the Toronto Star Nightingale award and received several letters of thanks from people she had helped. She also helped train countless student nurses during the practical-experience part of their education. She aided the sick and comforted the dying and their families. One doesn’t usually see one’s spouse in a working environment, especially in the medical field, but I was once granted that gruesome privilege. We were among first on the scene of a serious boating accident. I won’t go into detail, but her experience and quick thinking meant that one person lived to draw breath another day that otherwise would not have. The pride I feel for what she did to help that person and countless others is beyond my ability to express. I’m the Firmware Lead of Lumin Network Music Players. Thank you for publishing the review of Lumin D1. radio station, then send it to Lumin via AirPlay. recommended way to use a Lumin network music player. faster and makes the album / artist / genre / etc. views available. 2 Comments on Digital Music Player Reviews: Part 2, The Lumin D1, Plus….Umm, Bonus Content! Hmmmm, nice story Steve. Really nice. BTW, I have a “update” on the $1K cable thing … and, well …. I’ll post there. You know, after owning a pair of Hafy DH-200’s (circa 1985), I was hoping I’d never see one again. But, voila, here it is -along with aching memories! Long story short; find an original Adcom ‘GFA-535’ (same 60W/C as DH-120) but about ‘ten-times’ the amplifier (utilizing bi-polar outputs). Early Mosfet sound (perhaps even current) was not only in a perpetual “Mist”, but sorely lacked backbone/control/current delivery/speed, clarity and dynamics. In a nutshell, those amps were ‘weak’, ‘foggy/hazy’ -absolute ‘turds’ !